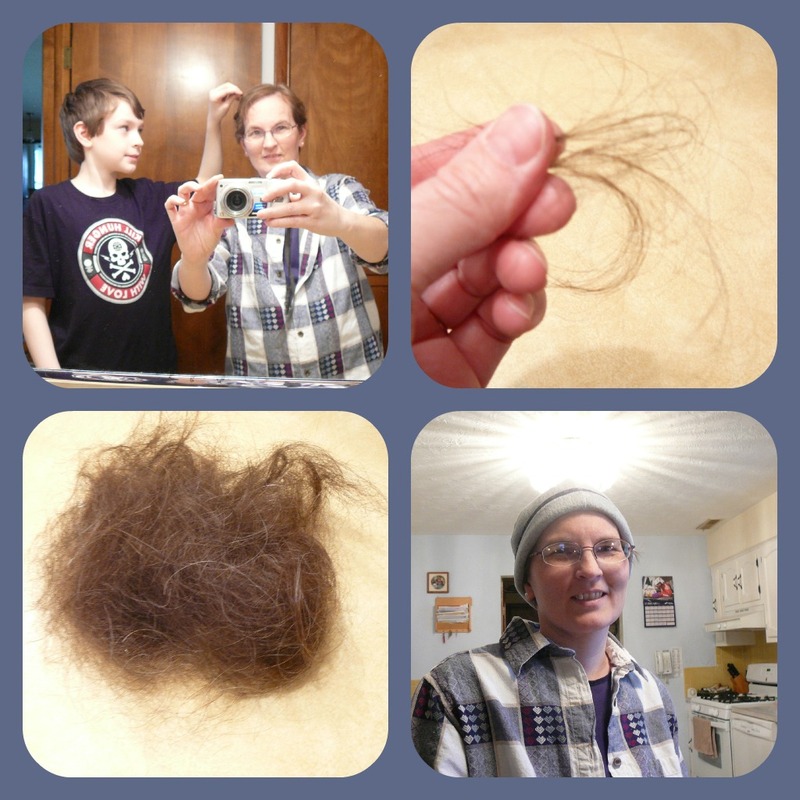 A few weeks ago, before my first chemo treatment, I decided to get my hair cut a lot shorter than usual. I wanted to start getting used to the fact that some changes were about to take place, and I would most likely lose my hair. It was a hard day for me, as I did not like the new look. I think it was actually harder for me to get the short haircut than it was for me to have the mastectomy! I guess its because hair is such an identifying factor in women. I also knew my husband prefers my hair to be longer, so it was just very difficult all around. But, David was great with me and told me it did not look horrible in the way I perceived it to be. He was so comforting and supportive, and he reassured me that this would only be a temporary thing. I thank God for a husband who loves me, and has chosen to stick by me for better or worse, in sickness and in health. After my first chemo treatment, I was told, if my hair is going to fall out, it would happen within 2-3 weeks. Several friends who have been through this said their scalp began to feel really sore before their hair fell out and, a couple of days ago, I noticed mine getting really sore to the touch. I knew this was a sign that my hair was loosening up. In today's mail, I received a hat I had ordered, so I went to the bathroom to try it on. While doing so, I noticed several strands of hair falling out. I, then, pulled lightly on my hair and ended up with quite a few strands between my fingers. It had begun. I called my 10-year-old son into the room because I figured he would be interested in seeing it. He was sympathetic for me, yet very curious. I, then, allowed him to help me gently pull the hair out, and we ended up with a large pile. Its not completely gone yet, but is very very thin. I know it won't take long for the rest to come out. Life is certainly interesting, but I continue to thank the Lord for his presence in my life. Because of Him, and because of the support of my family, I am doing okay with the hair loss. I know its all just part of the process. By the way, Chemo session #2 did not happen this week as planned. The doctor sees patients before each chemo session to see how they are doing and, after seeing me on Tuesday, he decided it would be best to postpone treatment for another week. I am still recovering from a cold/sinus infection, and he didn't want to take the chance of the chemo making things worse. But, since I was there, and since he said I looked a bit dehydrated, I was given a bag of fluids before being sent home. I will go back again next Tuesday for the treatment. First, you look really cute in that hat. You look a bit on the sporty side. Also, you are so pretty. Really, you are; not just in that awesome heart of yours but you are pretty on the outside too. You are going down a journey that I can tell you I hope to not face. But, watching you-reading your posts and sitting beside you sometimes when we talk your brave heart, your open spirit and patient spirit makes me feel so blessed to have you in my life. Thanks, Daneille. You all have been through a lot yourselves, and have been an inspiration to me. I am blessed to know you, too. Our God is good. You have been an inspiration to me as long as I have known you. What a joy you are to me and Carolyn. God has used this from your life into mine. Thank you. For all your posting and pictures. You are so precious.I thought back to the little son of my sister. He was also bald, after chemotherapy. Was wearing a cap.